Kicking off this week for the world of supercomputing is the 2014 International Supercomputing Conference in Leipzig, Germany. One of the major supercomputing conferences, ISC is Europe’s largest supercomputing conference and as one would expect, an important show for companies vested in high performance computing (HPC) and other aspects of supercomputing. We’ll see a few announcements out of ISC this week, and starting things off will be NVIDIA. NVIDIA will be taking to the ISC show floor to announce that their Tesla products will be adding ARM64 host compatibility, enabling them to be used in ARM64 systems. NVIDIA has been a supporter of the ARM ecosystem for some time through the use ARM cores in their Tegra SoCs and by enabling CUDA on ARM processors. Adding 64bit ARMv8 (ARM64) support then is a logical extension of this by bringing their hardware and toolkit forward to the new generation of 64bit ARM processors. However while NVIDIA’s previous ARM works have been focused on consumer uses, today’s Tesla ARM64 announcement is focused on the professional computing side and hence the use of ISC as a backdrop for this announcement. With today’s announcement NVIDIA is expanding their Tesla and HPC efforts into the ARM ecosystem, intending to bootstrap and support the growing use of ARM CPUs as the core processors in HPC setups. ARM CPUs have already made some headway into the micro server space for tasks that require many low performance threads, however it’s not until ARMv8 that ARM processors have gained the ability to address enough memory and have gained enough in performance to be useful in HPC applications. 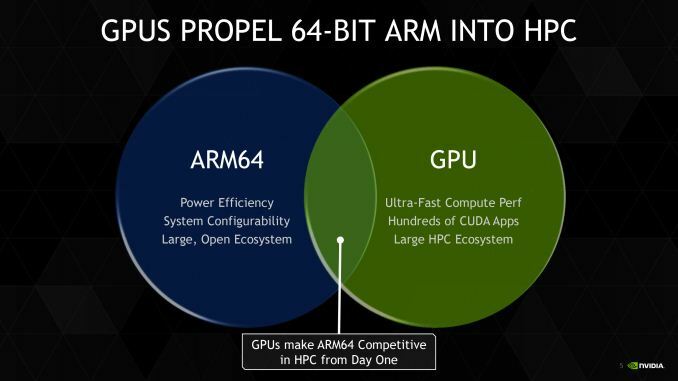 With the increased capabilities of ARM64 processors, HPC system builders can now design systems around ARM, with NVIDIA taking up their now well-defined position as a GPU supplier to provide their highly parallel processors to complete these systems. All things considered NVIDIA is not necessarily introducing new functionality or new performance, but the addition of ARM64 support means that NVIDIA is hedging their bets in the server space. The company already supports Tesla products connected to x86 servers in traditional HPC setups, will offer deeper Tesla support on POWER platforms through their forthcoming NVLink interconnect, and now the company is covering the other end of the spectrum by offering Tesla support for ARM64 platforms. So far the ARM architecture has yet to prove itself in the HPC market beyond some very specific micro server roles, but with NVIDIA’s continued success in the HPC market and the potential for ARM to disrupt the traditional x86 market, it’s not surprising to see NVIDIA hedging their bets just in case that disruption occurs. No matter what happens – x86 holds, POWER takes off, or ARM disrupts – NVIDIA intends have the market covered. 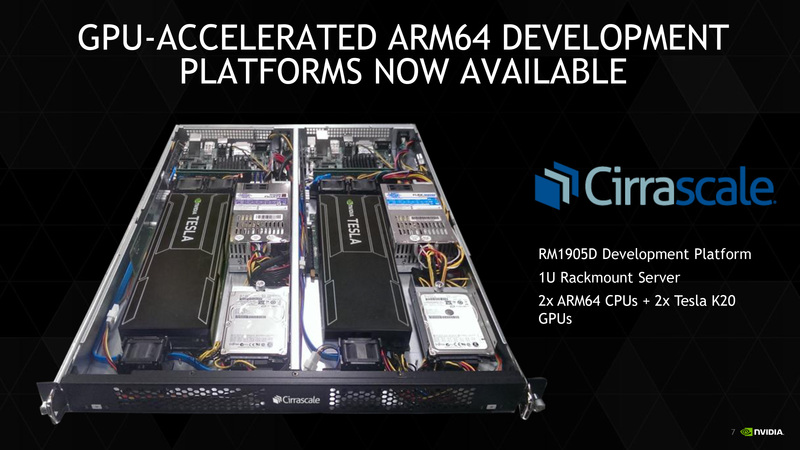 To that end, along with today’s announcement of ARM64 compatibility NVIDIA is also announcing the first Tesla ARM64 development platforms. In July, Cirrascale will be shipping their RM1905D 1U development platform, which contains a pair of Applied Micro X-Gene CPUs along with a pair of Tesla K20 accelerator cards. Meanwhile E4 will be shipping their EK003 system, a 3U system with two X-Gene CPUs and two Tesla K20s. The Tesla cards of course need no introduction, and meanwhile the X-Gene is an in-house design from Applied Micro that has 8 ARMv8 cores clocked at 2.4GHz. We have previously looked at the X-Gene design a couple of years back, and while they didn’t end up being the first shipping ARMv8 design (Apple’s Cyclone beat them), they are the first ARMv8 design shipping with the appropriate PCIe support to be paired up with Tesla cards. At the time Applied Micro was shooting for a fairly aggressive performance level, but as of right now we don’t know how the X-Gene compares to other ARMv8 designs such as Cyclone, Cortex-A57, and NVIDIA’s own Denver. Finally, being released in conjunction with these platforms will be the CUDA 6.5 toolkit, which will be introducing ARM64 support on the CUDA side. 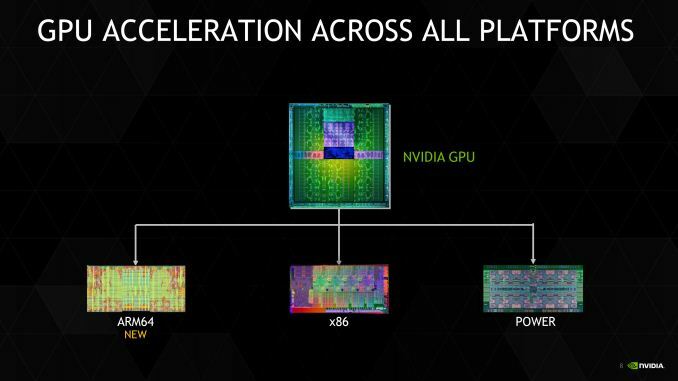 NVIDIA has not announced a release date for CUDA 6.5, and at this point it’s safe to assume it’s a development release alongside these ARM64 development platforms. I think you are confusing x86 with Intel. Nvidia chips have worked with AMD, Cyrix, and VIA x86 processors since the start. PowerPC chip support has also been around for a while due to gaming platforms and Apple's old G series workstations. The main issues that kept ARM chips from working were just a lack of PCIe and perhaps the same endian issue as powerPC, but the first was easy enough to avoid by including PCIe in the chip design and the second was already solved for the powerPC chips. I think what he means is x86 won't be serving the tesla's soon. They will be Denver's or Boulders etc. An all NV solution so to speak, no AMD or Intel feeding the gpus. That should add some to tegra sales in whatever form they use to feed their gpus. Whatever cuts out Intel is good business as far as NV is concerned and ARM is the way they're going to do it. Gaming and servers first, apps later once ARM64 boxes show up with 500-1000w PSU's and of course NV discrete cards, SSD+HD, 32GB etc etc (everything you get in a powerful pc box today). NVlink in there to replace hypertransport/infiniband etc. Make no mistake NV wants Intel dead as revenge for killing their chipset business (+ lawsuit over other stuff etc, no love between them). Building great gaming on the ARM side is the first salvo, feeding servers with their own socs in the 2nd, and Boulder itself will come at some point for server assault. After that it's apps over on ARM for the final piece of the puzzle. I'm talking the Adobe Suite etc type stuff so you can at some point REPLACE WINTEL completely without users feeling pain of missing apps or gaming. It's a 5-15yr plan (longer? who knows) and Jen is willing to wait it seems rather than sell out for a quick buck to Intel. Intel's best defense against ARM is buying Nvidia (immediate best gpus, top end SOC, Boulder coming, software modem to complement their own hardware modem so versatility for OEM's etc), but it seems Jen has no plans to take the easy way to a few billion more in wealth today. Why should he, he may end up with 10-20B in 5-15yrs and cause real damage to his mortal enemy Intel. Maybe Intel hasn't offered enough if there is such a price. You'd think Intel would just offer a $2-3B personal check + 22B for the company but if they don't get it done soon it may get too expensive for them. Though I also think that nvidia has creted a path to continue living without being x86 dependent, I also think that that path is not that really easy to follow. Under the point of ARM cores, performance advantages possible with custom designs are limited (see Qualcomm). What nvidia can make difference is in the GPU part of the SoC. However high end, super power, full featured SoCs are just a small piece of the entire potential ARM market. All the other part of the market is domiated by cheap SoC where you do not really get much of incomes and you are very keen to high competitions. nvidia hope is that ARM with enter HPC server market and possibly desktop one. While for the first creating good, high performance, low power HW is all that is needed, for the second unfortunately you also 3rd parties application support. And it is here that problems araise.